For adventure for wanton vices that I have canoodled with in the dark. and if it will then excite me, forcing me to destiny. Because alongside the plums I too have wondered. And I have seen where burning parrots go to lay their eggs. I have climbed the branches of sleepy trees. And whether birds in plum sauce taste different when they had no place to go. I have sold a bit of cocaine or rather split the bag. And I bite them sometimes just to taste. I wonder if I can be happy without a queen, without foghorns and fog. Some chitinous bugs or some strange new concoction of taste I have never dared to yet try. That thirsts for host, not gold. Hello everyone. Forum is having a fundraiser at the Hotel Utah Saloon on October 11th. The show starts at eight and there will be a reading from the award winning poet Rusty Morrison, followed by live music from Francessa Lee, and an open mic. 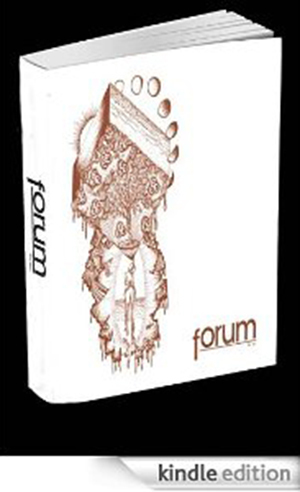 The cover is seven dollars and the proceeds will go toward Forum. Hotel Utah is located at 500 4th st, and the corner of 4th and Bryant. For more information and directions head to http://www.hotelutah.com.